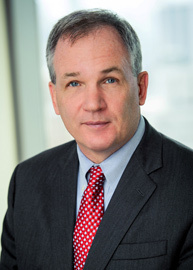 Fitzgerald is a partner at Skadden, Arps, Slate, Meagher & Flom, where his practice focuses on internal investigations, government enforcement matters and civil litigation. Prior to joining Skadden in 2012, he served as the U.S. Attorney for the Northern District of Illinois for more than a decade. Appointed in 2001 by President George W. Bush, he was the longest-serving U.S. Attorney ever in Chicago. As U.S. Attorney, Fitzgerald led many high profile investigations and prosecutions, including the convictions on corruption charges of Illinois governors George Ryan and Rod Blagojevich and the fraud conviction of media figure Conrad Black. He also served as special counsel to lead the investigation in the Valerie Plame matter and tried the case of United States v. Lewis “Scooter” Libby. During his tenure, the U.S. Attorney’s office prosecuted significant fraud, civil rights, organized crime, narcotics and national security cases. Fitzgerald also was involved in a number of nationwide initiatives, including the President’s Corporate Fraud Task Force and the Attorney General’s Advisory Committee. Fitzgerald also served as an Assistant U.S. Attorney in the Southern District of New York. Notable cases included United States v. Usama bin Laden, et al., in which defendants were charged with and convicted of conspiracy to murder U.S. nationals overseas and the 1998 bombings of the U.S. embassies in Kenya and Tanzania. He also participated in the nine-month trial of United States v. Omar Abdel Rahman, the prosecution of a conspiracy to attack the United States that involved the 1993 World Trade Center bombing. Fitzgerald received his bachelor’s degrees in economics and mathematics from Amherst College and his law degree from Harvard Law School. He is a fellow of the American College of Trial Lawyers. He has received numerous awards and recognition during his more than 20 years in public service. Preregistration for this event is encouraged. This lecture is approved for 1.0 professionalism CLE credit in the state of Illinois. To receive credit, attendees must sign-in onsite during the event. In 1991, the Chicago firm Pope & John Ltd. established a lecture series at Northwestern Law. Each year, the Pope & John Lecture on Professionalism focuses on the many dimensions of a lawyer's professional responsibility, including legal ethics, public service, professional civility, pro bono representation, and standards of conduct. The series is part of the Law School's Bartlit Center for Trial Advocacy, which is directed by Professor Steven Lubet.